Verifone is going beyond payment solutions with Developer Central. 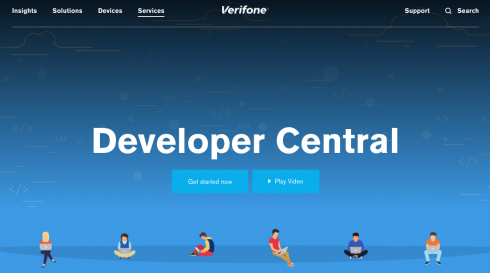 Developer Central is the company’s development platform where developers can build and deploy non-payment apps for Verifone’s payment devices. The company showcased some of these applications at Money20/20 USA in an attempt to demonstrate how apps are helping merchants grow. The apps that were showcased included Ecwid, vLoyalty by vPromos, GiftFly, Homebase, and iMobile3. Ecwid is an e-commerce platform that enables small businesses to sync their online store with their physical stores. vLoyalty by vPromos is a card-linked loyalty program solution. Giftfly is a solution that allows businesses to sell physical and digital gift cards to anyone at any time. Homebase is an employee management system that allows business to build better schedules and track hours from anywhere. And iMobile3 empowers merchants with state-of-the-art POS solutions that are custom-branded for their business with inventory management, staff administration and transaction reporting. According to Verifone, all of these apps vary in their purposes and they demonstrate just how many different types of apps developers can create on this platform. With Verifone’s Developer Central platform, developers are able to create apps in 10 different categories: point of sale, labor management, accounting, inventory management, food delivery, omni-channel experiences, loyalty programs, alternative payment programs, finance programs, and marketing and BI programs.